Founded in Brazil in 1911, Tramontina brought its business to the U.S. in 1986. The company has been manufacturing cookware at the Wisconsin facility since 2005. The plant is one of the facilities made available when the former Mirro Co. cookware plant shuttered its operations in 2003. Today, Tramontina manufactures more than 25 million pieces of cookware each year in the United States. In early 2017, Tramontina US Cookware invited the A.C.E. Team to make improvements and help expand the company’s Manitowoc manufacturing facility. 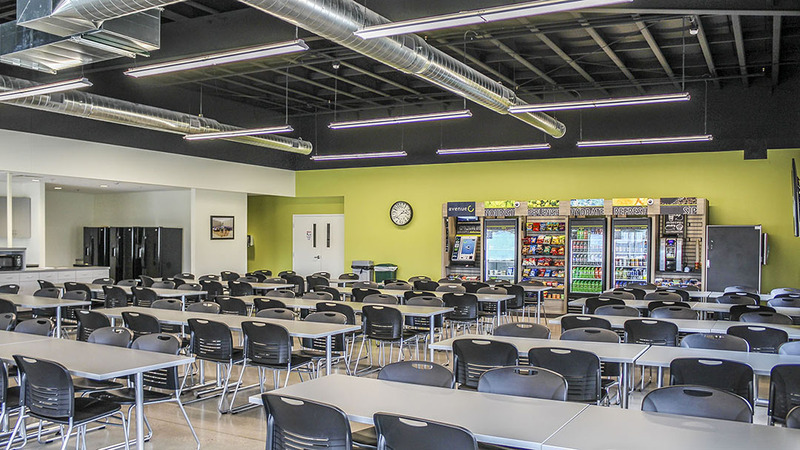 Our project — a lunchroom/café and office expansion project at Tramontina’s 2005 Mirro Drive plant — was designed to accomplish three specific goals. The first objective was to transform the existing employee break area — at the time a sectioned-off portion of the production floor separated only by barricades — into a distinct and attractive space. 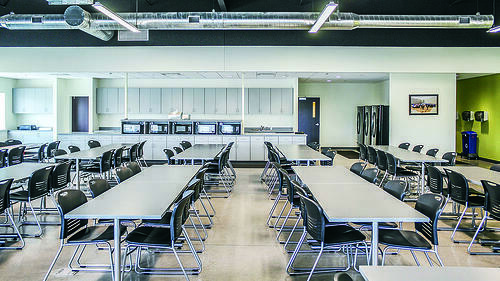 Now this dedicated employee cafe area boasts more than 3,000 square feet of space and many new amenities including hand wash sinks, food warming and preparation areas, a seating area, and cutting-edge vending options. Contemporary colors and modern design elements, such as views to the outside via large windows that also let in natural daylight, are a major aesthetic improvement. Best of all, the cafe opens into an outdoor seating area employees enjoy during the warmer months of the year. A second goal was to increase the office footprint and amenities. New spaces were created: a visitor welcome and reception area, a board room, a product display area, and an executive kitchenette were incorporated into the design. Additionally, the project included new private office and cube workstation space. Thirdly, A.C.E. Building Service installed built-in casework for display of a variety of Tramontina products. This handsome feature now greets visitors and guests who enter the building. Lastly, we paid attention to the small details that make a big impact. Finishing touches can make a big difference. The Tramontina project also offered benefits from freshening “face lifts” for existing offices, as well as minor alterations to enhance security and traffic flow. A.C.E. Building Service project staff worked with Tramontina's designer to make final interior material selections and to define the scope of improvements. 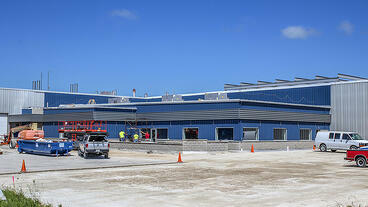 We also worked with SMI, Inc. of Manitowoc which provided engineering services. Our work also included development of a concept for the exterior appearance of the addition. 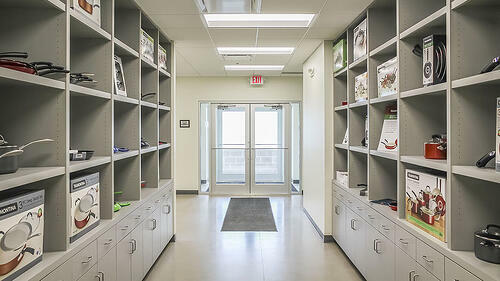 The existing building was a 350,000+ square foot facility originally constructed in the in the 1960s. Though it was expanded over the years, the appearance of the facility stayed the same, with embossed aluminum panel cladding and an industrial appearance. Construction scheduling is a critical component of success at a fully operational facility. While the official start date was March 22, 2017, this design-build project kicked off with placement of thermal blankets over the expansion area in December 2016 to lessen the effect of frost on the ground. This allowed us to break ground in mid-March without having to employ a ground thaw heating unit. As a result, the entire slab-on-grade addition slab was poured by April 7. This allowed completion of the Butler® pre-engineered steel building expansion in late summer. The entire project was finished January 12, 2018. Our team is delighted that our client is entirely satisfied with project outcomes. Flexibility, it turns out, is a two-way street.